K'Ehleyr described herself as being "trapped between two cultures" with bi-racial parents. 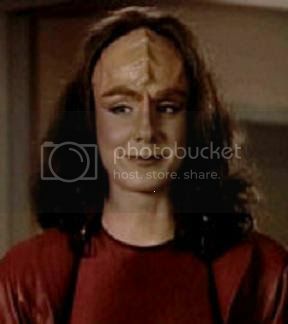 Having the humor of her mother and the temper from her father, she preferred her human side and exercised tight control of her Klingon tendencies. Her Klingon side nevertheless gave her strength, even if terrifying. Though K'Ehleyr knew much about Klingon culture and fighting techniques, she never showed much respect for Klingon values. In 2372 she was reassigned to the USS Uhat to lead a mission with an experimental slipstream drive acquired from the Gawl, a race that was wiped out by the Founders for sharing the technology with the Federation instead of them, to rescue the crew of the Enterprise-D that was trapped in the Delta Quadrant. During the chaos K'Ehleyr was trapped on the Prometheus and forced to leave her quantum reality. She was promoted to Rear Admiral after arriving in Prometheus' home quantum reality and assigned to work Admiral Satie at Starfleet Academy. In 2379, she was assigned to Deep Space Nine to oversee the trainees on the Enterprise (NCC-1701) under the command of Captain Spock which was now a training vessel.